Orange roses line up on this beaded bracelet. The design of the Art Nouveau roses is an original pattern of mine. Pat Austin is a trade name for a particular copper colored English tea rose. The color of orange is that of passion and enthusiasm. 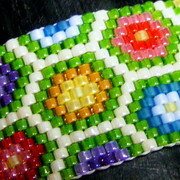 This bracelet is 6-1/2 inches long and 7/8 inch wide. The beading is two-drop peyote method. 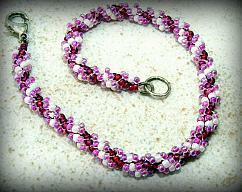 The clasp is two glass beads with two bead loops. Handmade in a smoke-free home.